WITH international events on the calendar and government efforts to assist with the revival of Bahrain’s economy, the recently opened K Hotel is confident that recovery is on the cards. The property, which is part of the Gulf Hotels Group, was soft opened in February and had its official launch in May. Officially a four-star deluxe, the K Hotel aims to offer five-star facilities and services, benefitting from the overflow from its long-established sister property. The venue consists of 237 luxurious, contemporary rooms and suites offering services and facilities similar to five-stars but at lower rates. Amenities include air-conditioning, interactive flat screen television, mini bar, safe box, internet connection and well-appointed bathroom with separate shower and bathtub. The hotel also has four food and beverage outlets including Klouds Restaurant, the all-day-dining venue, Mo Kan, a trendy Asian-style eatery, La Terrazza bistro located next to the pool area and The K Lounge at lobby level. 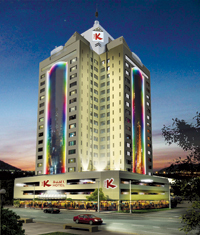 Spokeswoman Cristalyn Pastrana said: “As The K Hotel is a very unique property with state-of-the-art facilities and five-star services and amenities we’re attracting a good share of business. She added that, like most of the island’s businesses, the property was affected by the recent unrest but said that in some ways the K Hotel benefited due to its location and affordable offering. And Pastrana said government efforts to help the tourism industry, such as the staging of major business and cultural events and assistance with participation at major trade events outside the country are really starting to pay off. Like many other hoteliers she said food and beverage has been the first area to recover and said a proliferation of new venues continuing to open on the island is a good sign for the future of the hospitality industry.